1. Preheat the oven to 220˚C, gas mark 7. 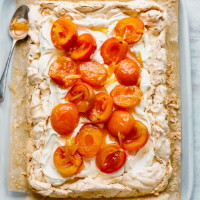 Toss the apricots, ginger, syrup and 2 tbsp sugar on a baking sheet. Roast for 15 minutes, until soft; set aside to cool. 2. Meanwhile, line a large, rimmed baking tray (about 25cm x 30cm) with baking parchment. Whisk the egg whites with a pinch of salt to stiff peaks, then gradually whisk in the 250g sugar. In a small bowl, stir together the cornflour and vinegar, then whisk in. Finally, fold in the nuts and spread out on the tray. This recipe was first published in Mon Aug 01 16:18:00 BST 2016.